Chuck Discovers a Whale on the Subway | Words. On the Internet. FULL DISCLOSURE: This picture took longer to make than I’d like to admit. “Hey,” Chuck said, nudging the guy next to him. “This is the C train, right?” He had rushed to catch the train before it left the station and wasn’t sure if he’d accidentally climbed aboard the wrong one. It definitely looked different. “Yeah,” said the man with a slow nod. He had long hair that drooped below his forehead and stopped just above his large, circular glasses. “Great,” Chuck said. “Great.” He turned back toward the window and stared out at the green pastures ahead of him. They made him feel uneasy. It wasn’t that they weren’t beautiful, the endless hills softly rising and falling into the horizon, it was just that he wasn’t accustomed to seeing green on the C train between West 4th and 23rd Street. Usually it was just the darkness of the underground. “What?” said the man, shifting his body toward Chuck slightly. He was wearing some sort of long, brown robe, which wasn’t exactly abnormal for the New York City subway system. Chuck had once sat next to, and incidentally gotten into an uncomfortable conversation with, a man wearing a large, black garbage bag. He claimed to be wearing it to keep the N.S.A. from harnessing his body. Chuck agreed that he didn’t want his body to be harnessed, but felt that wearing a garbage bag wasn’t exactly the best way to prevent such a thing. He decided not to heed the man’s advice. “You’re positive this is the C train?” Chuck said. The man leaned forward and stared up at the subway map above him. “Great,” Chuck said, returning his attention to the window. It looked like they were now traveling through some sort of forest, the trees bare and long since dead. Their branches reached out at the train, as if grabbing for it, slowly waving in the wind as it passed. “Great,” Chuck whispered. He leaned back in his seat and closed his eyes. It wasn’t too strange for the C train to be running abnormally, even if there weren’t any posted changes. In fact, the C and E trains weren’t running at all last Tuesday and there wasn’t a single mention about it. He ended up having to take the A train up to Penn Station, then walk down to 23rd Street just to get to the gym. Sure, he could’ve taken a different train down, but it was a nice day out. Plus, he didn’t really have anywhere to be aside from the gym. Today, though, he had a job interview with J. P. Morgan, which was coincidentally back on 23rd Street. He figured he’d hop on the train, take a quick five minute ride up, and then be out before lunch. The man leaned forward and stared out the window ahead of them, with Chuck following suit. The train was now completely submerged in water. A large whale swam by the window, its body easily larger than the entire subway car. Chuck wasn’t exactly cetologist—a word he’d recently learned on the Discovery Channel—but he guessed it was a blue whale. It let out a high-pitched cry. The man leaned forward and glanced out the window, then shrugged. A stick of some sort was poking out from his robe pocket—or at least Chuck hoped it was a stick. The last man he’d seen wearing a robe on the Subway also had something poking out, but it certainly wasn’t a stick. “Where are you headed, anyway?” said the man. “Interview,” Chuck said, glancing at his watch. He was supposed to be there in just five minutes. “Can’t beat face-to-face,” Chuck said, shrugging. He wasn’t really a fan of phone interviews. They always felt impersonal, and he tended to suddenly adorn a deep, southern accent as soon as the interview began. He’d never even stepped foot in the south. “I guess,” said the man, brushing the hair out of his eyes and glancing down at the book in his hand. It was written in some sort of foreign language that Chuck hadn’t the faintest recognition of, which he didn’t feel was too abnormal. Chuck had only ever learned English and didn’t think he could discern French from Ancient Egyptian. Chuck glanced back out the window. Snow was now falling, the silhouette of faintly visible mountains in the distance. He felt an uncomfortable sense of familiarity form in his chest, but ignored it. The man seemed pretty confident the C was running normally and Chuck had faith in the stranger. Chuck sighed. The weatherman had promised comfortable temperatures today, high 70s to low 80s. Chuck had dressed accordingly, wearing a nice polo shirt and slacks that he felt were appropriate for the interview; they told him to dress casually. He did not expect heavy snows in the middle August, but he should have known better than to leave the house without at least a sweater. “Fine, one more,” said the man in a slightly irritated tone. 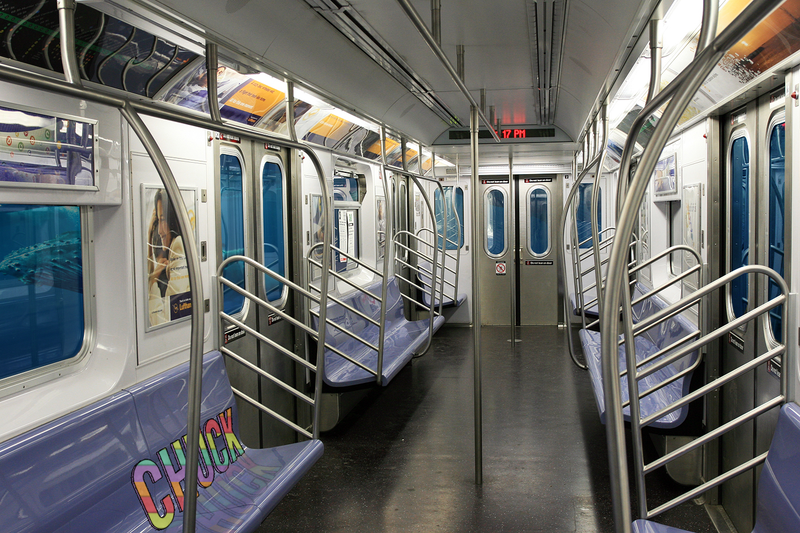 Writing Prompt: You get on the subway to go to work in the morning, same as you always do. But this time, the train magically takes you and the other passengers somewhere completely unexpected.